The zebra mussel Dreissena polymorpha (Pallas, 1771)) invaded the Great Lakes about 1987 or some years earlier. It spread so quickly and reached such high densities that this sessile filter feeder had an impact on these ecosystems and became the most serious biofouling pest as well. In due course, zebra mussels became synonymous with invasions of aquatic nuisance species. Projects, conferences, workshops, publications, theses, proceedings, newsletters, reports and websites concerning this species became booming business. However, international books dealing exclusively with zebra mussels and their relatives are only a few. One of the most important books with contributions from North American as well as non-North American authors is a 810 pages thick book edited by Thomas F. Nalepa and Donald W. Schloesser (1993) dealing with all aspects of Zebra mussels biology, impacts and control summarizing the European experience and knowledge thus far completed with recent studies from North America. One year later in 1994 another book of 227 pages was published by Renata Claudi and Gerald L. Mackie entitled “Practical manual for zebra mussel monitoring and control”. This practical, well-written guide was intended for engineers, technicians and operators at power utilities, industries and water or wastewater treatment plants. In 1997, another book appeared edited by Frank M. D’Itri, entitled “Zebra mussels and aquatic nuisance species” (638 pages), which was, in fact, the proceedings of the Sixth International Zebra Mussel and Other Aquatic Nuisance Species Conference held in Dearborn in 1996. The Europeans produced in 1992 also a book on the zebra mussel, the result of a meeting of German, Dutch and French researchers involved in studies on population dynamics, ecophysiology, ecotoxicology and biomonitoring. This book edited by Dietrich Neumann and Henk A. Jenner was entitled “The zebra mussel Dreissena polymorpha” with the subtitle ecology, biological monitoring and first applications in the water quality management (262 pages). This book has emphasized the use of zebra mussels as early warning systems for water quality control and as biological filter to mitigate the effects of eutrophication and other pollution. Why should we add a new book to the 1937 pages of information available in these four books? 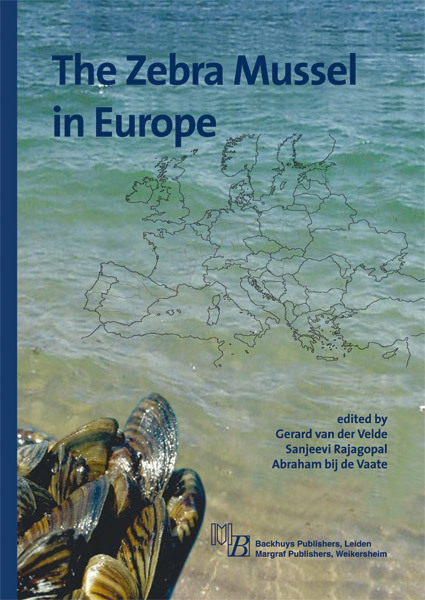 We noticed that a book specialized on the European experience with the zebra mussel and its relatives was lacking in spite of the origin from and early invasions in that continent. Furthermore, we have 10 years more experience with the zebra mussel since the last book was published. The last decades represent a new phase of zebra mussel invasions in Europe with range extensions towards other countries such as Ireland and Spain, as well as range extensions within countries. The latter probably is generated by increased economic and recreational activities as vectors for dispersal coinciding with water quality improvement and with climate change. Another argument in support of this book is that the literature on the zebra mussel is nowadays so numerous and widely spread, that a new overview is long overdue in order not to get lost in heaps of publications and grey literature. The present book is an up-to-date overview of specialists with contributions on all aspects of the zebra mussel. It gives information on fossil and recent species, distribution and dispersal, genetics, food, growth and life history, ecology and ecological impacts, endosymbionts, parasites, predation, indication for water quality and applications, biofouling and control. We sincerely hope the book serves the function it is intended to and becomes a valuable addition to the literature on zebra mussels.